That’s why changes in their behavior can be disconcerting. If you’ve just encountered a stressful situation or your pet is around more changes than normal, here are some signs they may be experiencing some stress or anxiety. All dogs seem to shed, but have you ever noticed how much hair can come off when your dog is stressed? According to PetCareRX, it’s one of the most easily recognizable signs your pup is feeling a bit anxious. You might see this happen in the veterinarian’s office as you pet your dog in the exam room and the hair covers your hands and the floor. Excessive shedding due to stress can also be triggered by big life changes at home, like moving, adopting another pet or a family member moving out. Dogs use their bodies to convey all sorts of emotion they can’t verbalize. According to Service Dog Central, if your dog starts excessively licking their mouth or nose, this is probably a sign they are feeling a bit stressed. More: When does dog anxiety become a serious problem? It seems odd that yawning would be considered a sign of stress — wouldn’t it just be a sign of tiredness? But the stress yawn is usually seen in conjunction with other behaviors, such as avoidance or pinned ears. Dogs generally pant to cool themselves down when it’s hot or they’ve been exercising. If your dog is panting for no apparent reason, possibly with her ears pinned back and low, this can be a sign of stress. Be careful if the dog suddenly stops panting and closes his mouth, as he may be escalating toward biting. Especially in the more aggressive breeds, dogs may try to alleviate stress by chewing or biting furniture (or you!) or even by destructive biting or licking of her own body. Try to examine the circumstances that increase the behaviors, such as being left alone or when other animals are present. According to VCA Hospitals, this is another telltale sign of stress. There are many reasons your dog may show avoidance, whether it’s avoiding other dogs or people. Tail tucked, avoiding eye contact, turning away — these are all ways your dog shows you he is uncomfortable. It’s important to remember that if your dog is avoiding a situation that makes him uncomfortable, this is better than showing aggression and it’s best to respect this message. Does your dog exhibit signs of stress with physical symptoms? 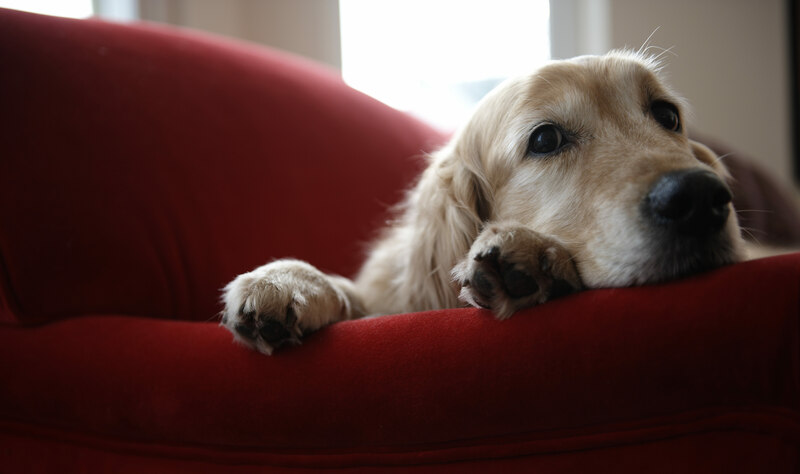 Loss of appetite, vomiting, diarrhea, skin problems or allergies can all be signs of stress in man’s best friend. If any of these physical symptoms don’t have an obvious cause, stress could be your prime suspect, but you need to check in with your vet to make sure you catch any serious medical conditions. Does your dog howl or bark a lot? Excessive barking, whether inside or outside the house, can be a sign of anxiety. Try to find a pattern to the barking to determine the cause of the anxiety. Does it happen when you’re gone? When strangers come to the door? Recognizing your dog is experiencing stress is a step in the right direction — but now you need to find ways to help him cope with his anxiety. I asked my vet for some tips on keeping my dog’s life as stress-free as possible. Here are some of the ideas my vet shared. Keep things as routine as possible: Routine is important for dogs, just like it is for young children. They suffer less stress when they know their routine, from where they sleep to what time of day they go for a walk or eat. Prevent stressful situations: If you know, for example, your dog doesn’t do well in crowded situations, don’t walk him on a busy recreation trail. If your dog is stressed when you aren’t home, crate training might bring him some comfort. Exercise often: Exercise can be a great stress-reliever for your dog as long as it’s kept fun and relaxing. Repetitive games of fetch at the dog park can actually cause stress in some dogs, so make sure you find the right balance. Spend more time together: If you can, spend more time with your dog to reduce stress. Working out in the garage? Bring your furry friend out there with you. He craves being near you and it’s good for his soul (and yours). Rules: Dogs experience less stress when they know what’s expected of them. Set your house rules and be firm yet gentle about any disobedience. Your dog wants to please you, but cannot possibly succeed if the rules keep changing. By working with your dog and setting clear boundaries, you can usually pinpoint the sources of his stress and work with him to help him live a less anxiety-ridden life. A version of this article was originally published in December 2013.